Bird news from Vietnam, from Vietnam's resident and visiting birders. Bach Ma National Park is open again, since it was closed for several years because of reconstruction of the road. One still feels that the park has been abandoned for a while. The only facilites working currently are the ones of the national park administration (but that's all you need). The private hotels in the summit area are all closed down and pretty run down. One builing is being renovated and will probably re-open soon with big restaurant and pool as it looks. The pagoda on the top is also pretty dilapidated, but I guess all these things will soon be revamped to cater for the local tourists, who were already quite numerous during daytime. The park administrations allows cars or taxis to drive up the mountain, but not motorbikes. Visitors coming by bus and xe om need to hire transportation from the park. I went there by taxi, which dropped me off at the facilites of the summit area (Villa Do Quyen), and also left by taxi, which the guy from the park facilities arranged for me. I birded around the paths of the summit area, one morning I arranged with the park people to bring me down to the pheasants trail and pick me up again by noon. I stayed 3 nights. One day I was with a guide, Nhan, who was very good with his birds and also good company. You can contact him directly or via Vietnambirding. One morning I was with world travelers Marie and Olivier. The rest of the time I went by myself, which is easy as trails are easy to find and also well marked in the map the park provides. I did a mix of birding from the road and on the trails. 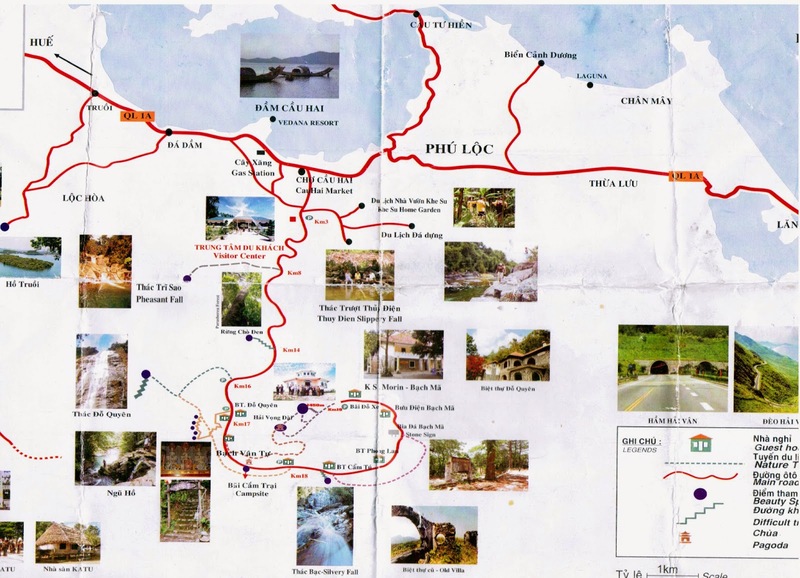 The trail mainly used by tourists is the one from the park facilites (Villa Do Quyen, restaurant) to the water falls and should best be avoided after the early morning hours. On the other trails I didn't meet other people. Weather was fine, sunny and not a drop of rain, almost no wind. Still birding was very hard. Very quiet, little activity. It was really hard to find birds, let alone interesting ones. On my first afternoon, I went the trail from the glasshouses near the restaurant to the summit. It took me more than an hour to find the first bird at all, but it was a nice one, a Silver-breasted Broadbill. Further on I found a few flycatchers: the resident Blue-throated Flycatcher and White-gorgeted Flycatcher, and a nice passage migrant, a Feruginous Flycatcher. On the summit there where a pair of Black Eagles close overhead, which remained the only raptors seen (I head brief views of Sparrowhawks and a likely Hawk Eagle as well, but too short to ID). It was very quiet all afternoon, only Common Cuckoos were calling constantly, later in the evening replaced by Large Hawk Cuckoos. At dusk I saw two Nightjars in the sky near the restaurant, not sure which species that could be. Otherwise I did not hear or see nightbirds, despite going out on the roads a bit at night. The moon was very bright, probably that's why it was quiet. Next morning, started well: I got nice views, with coffee in hand, of Black-throated Laughinthrush, Lesser Necklaced Laughingthrush, White-browed Scimitar Babbler and Ratchet-tailed Treepie just below the restaurant. Later, with Nhan, we tried hard to find the Short-tailed Scimitar Babblers (now called Indochinese Wren Babbler), we had a few singing but they refused to show. Only with the last light of the day, we finally got to see a pair, in the gully right below the stairs of the trail learding from the restaurant to the waterfalls. We were lucky with Silver Pheasant and had nice views of a male and female down the slope from the road. Indochinese Green Magpie was seen well several times, but the Red-headed Trogons were surprisingly difficult to see. The next morning I went to the pheasants trail, but found very few birds. A Blue-rumped Pitta was calling around half way to the end of the trail, but I could not find it. Gibbons were singing until about 8 am, that was nice. Otherwise there were a couple of Babblers, Flycatchers and Rufous-throated Fulvettas. No Blyths Kingfisher at the river, but a Striated Heron. The best sighting was back on the road, when I went up the road a bit while waiting to be picked up. I heared some noices from down the valley, was lucky to stand in a point where I could find views down, and could watch at least four Brown Hornbills moving through the canopy. Great! Also near from the road I saw a group of Stump-tailed Macaques, the only mammals seen apart some Pallas Squirrels and two Giant Black Squirrels. The remaining time I spent again around the summit area, saw mostly more of the same, but also found the Long-tailed Broadbills and two species of Forkail: a family of Slaty-backed Forkails and a breeding pair of White-crowned Forkails, which I inadvertently flushed from the nest while crawling up a stream. In the evenings, Rufous-throated Partridges where calling from everywhere. I did not try for Annam Partridge, which according to Nhan is best found around the entrance to the park at the bottom of the mountain. Nhan also said that he hasn't heard Crested Argus for some years now. I also saw a Red-billed Leiothrix, shouldn't this one be only in northern Vietnam? Red-shanked Douc Langurs are apparently difficult to see in Bach Ma, and I didn't see any. However I was so lucky that my plane from Danag was delayed for 4 hours, just perfect to find the Doucs at Son Tra Peninsula. Below the park map, which is good enough to find all the trails (click the map to see it bigger), and the full (but rather short) list. Red-shanked Douc Langurs….. a sight to warm a birder’s heart also. Are they easy to find at Son Tra Peninsula, Florian ? Hi Sebastien, yes they are (relatively) easy. I went twice so far and found them on both occasions, rather close to the road. I went afternoons, and they came out towards 17:00, but I guess mornings should also be good (or better, because less people around). This is a collective blog for birders based in Vietnam, and those visiting Vietnam, to share sightings and information. If you are visiting and wish to contact us or add your sightings then leave a comment to a blog post with your email address and we will contact you. The bird records on this website constitute unverified reports only. Notable records will be written up and published in due course.